Welcome to the 2017 Mixed Division Club Mega-Preview! This is a wide angle look at the competition this season, plus a preseason ranking for the top 25 teams. Remember that Ultiworld will be filming club games all season long and you can get access to every game with a Full or Plus subscription! 1. Can Mixtape finally win one? When Seattle Mixtape, née Ghetto Birds, burst onto the national scene at the 2014 Club Championships, they seemed gleefully ignorant of — or at least unconcerned with — their immense potential. Now, three years on, they have become one of the flagship programs in the division, led by one of the game’s most colorful stars, who frequently and ardently makes the case not just for the greatness of his own team but for coed as a legitimate pursuit in ultimate. After two consecutive appearances in the national title game, Mixtape came into last year’s Club Championships as a pool top seed, but were for the third straight year dumped out of the title picture by nemesis Drag’n Thrust. With one of the more consistent cores of talent in the division, Seattle has loaded up this year with oodles of talent and look poised to make another assault on a title. This year’s squad may finally be able to get over that final hump and bring a national championship back to Seattle for the first time since Shazam and Sockeye both raised the trophy in 2007. 2. How big of an impact does Chris Mazur make? Last year, Chris Mazur straight up dominated the mixed division. Coming off an appearance on the Mixed National Team that represented the US at WUGC, Mazur took over nearly every game he played for Metro North en route to an Offensive Player of the Year award. His one-man-show in the Northeast final — while battling food poisoning — helped Metro to a regional crown over the eventual national champs. His semifinal performance against Mischief is the stuff of legend. His impact was felt at every tournament he attended. While it has always been clear that Mazur is a great player, do we truly know just how big of an impact he has in the division? 2016 wasn’t the first time Mazur was a key piece of a mixed team from the Connecticut that made a run all the way to the final. Coincidence or not, District 5’s star faded when their star handler decamped for PoNY — Metro North will now be hoping to avoid a similar fate. Meanwhile, with Mazur now in Dallas on Public Enemy, they are a trendy pick to take a step forward this year. What if we see a third mixed team ascend to the upper echelon with his participation? Perhaps we’ll find out that last season was more aberration than absolute. Perhaps 2016 was simply Mazur’s pièce de résistance, a perfect confluence of factors that allowed him to shine and also pushed his profile further into light. But are you ready bet against him right now? 3. What teams will surprise us the most? While there seems to be less parity and upheaval in the division with each passing year, that doesn’t mean we don’t still get surprises in mixed. New teams still form that find immediate success. Sometimes enough disparate talent consolidates in one place that programs make a short-term leap forward in class. Expecting that those days are completely behind is just begging to be proven wrong. The Tunnell siblings are starting a new team in Western Mass with some former Brute and Ironside friends, along with a bunch of younger players from around Amherst. Is it unrealistic to think a few more talented veterans sign on for a chance to play with Leila and Dylan? Even if the team claims that they don’t anticipate disrupting the order of Northeast mixed landscape, with an immense amount of top-end talent, their goals could change once in the heat of competition. But Happy Valley aren’t the only candidate to rock the boat this season. After a multi-year rebuild, Boston Wild Card have already flashed signs they could conceivably recapture the form that saw them play in the semifinals just a few years ago. Maybe this is a year where a Great Lakes team dominates their regional foes and then shoots up the rankings to unexpectedly earn a Nationals bid. Any number of teams in the 10-20 range of our rankings could follow Steamboat’s recent example and take a major step forward as a program. We may not yet know where this season’s surprise(s) will come from, but the only thing surprising would be if it didn’t happen at all. As Sarah Anciaux exits stage left from the division, she becomes the first major player from Drag’n Thrust’s championship-winning core that Minneapolis will have to learn to do without. Her all-around role as a cutter, distributor, and defensive stopper make for some incredibly big shoes to fill. 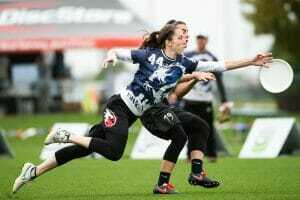 Perhaps the likeliest candidate to soak up the extra opportunity and responsibility left in Anciaux’s wake is her WUGC Mixed National teammate, Sarah Meckstroth. Meckstroth is by no means a new face or under-the-radar contributor. She and Anciaux tied for the team lead in blocks generated at Nationals last year and she has been a key receiver for the Minneapolis crew throughout their championship run, utilizing her speed and size to cut a big target in the endzone. Now a captain and the unquestioned female leader on the squad, Meckstroth’s ability to amp up her already insanely high level of play may go a long way to determining how dangerous Drag’n can truly be this year. For much of last season, Tannor Johnson was a legitimate Player of the Year front-runner. He did a little bit of everything — the big things and the little things — to help Slow White to their first ever national title, making some of the best defenders in the division look toothless as he went. The fact that he did this at age 19 and in his first season playing competitive mixed almost seems unfair. While Boston sees a not insignificant chunk of their 2016 core move on or retire after finally claiming a crown, the return of Johnson means Slow White will likely remain in the thick of things in 2017. He will again be counted on in a big way to take the tough defensive assignments and then drive the team down the field on offense. With another year of college experience under his belt — he helped push Massachusetts to a double game point semifinal loss to the eventual national champions at the College Championships in May — Johnson’s return should have the rest of the division on red alert. Over the past few years, Steamboat has quietly built one of the strongest programs in the division, a rarity considering they hail from a historically weak Great Lakes region. At the head of that transformation has been defensive wiz Nancy Haskell. While anyone who played against Cincinnati over the past few years very quickly learned who Haskell was, she had otherwise flown a little under the national radar for those that aren’t diehard fans of the division. The 2016 Defensive Player of the Year is no longer sneaking up anyone. Her lock-down person defense and heads-up poaching can stifle even the best offenses in mixed and key the long D-line runs that helped Steambot run away from opponents. If Haskell can repeat her performance in 2017, Cincinnati may be able to take the next step in their ascension and truly compete for a title. For years, Mark Burton has been tearing up the AUDL as a dynamic offensive threat, ripping hucks down the field or streaking deep on his own. 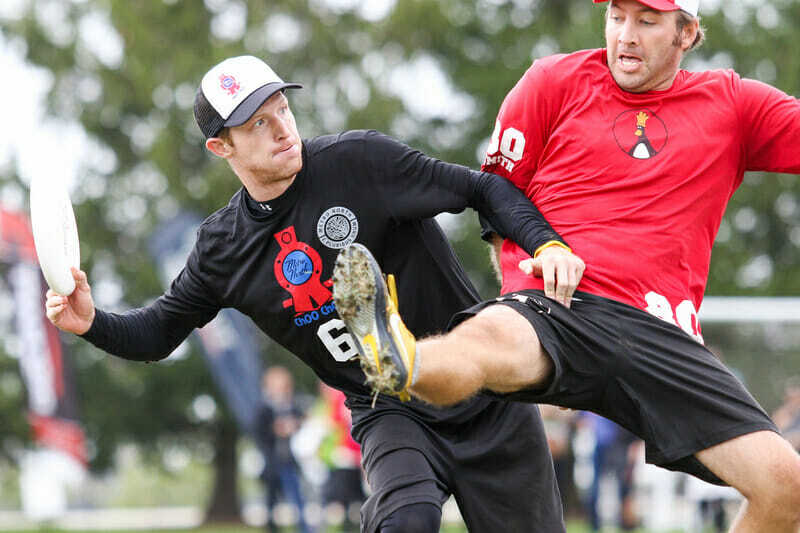 After two club seasons competing with Sockeye, Burton returns to the mixed division with Mixtape, a squad he helped shock the world in their first appearance at Nationals three years ago. Seattle’s opponents better be ready. Burton’s potent skillset add yet another dimension to Seattle’s already dangerous attack while his aggressive playing style and infectious energy are a perfect match for Mixtape’s brash team ethos. Beyond that, he has established chemistry with many of the team’s key returners, including AUDL teammate and squad lodestar Khalif El-Salaam. As Mixtape desperately hunt their first title, Burton will undoubtedly be a force on the Seattle offense and a key role player all season. Last year, No Touching’s offense was described as “tragically effective” by one fan who watched as Sam Valesano repeatedly torched the competition in Rockford. The Minneapolis squad clearly knew where there bread was buttered and made no qualms about setting Valesano up in isolation deep then throwing jump balls to their star receiver. While No Touching may not have anticipated their success last year, it doesn’t appear that they will be just a one-year blip in the division. The team has reloaded with some solid new talent and will be participating in the TCT regular season kickoff this weekend in Colorado. It would not be all that surprising to see Sam Valesano continue to dominate and lead No Touching back to Nationals for a second consecutive year. Now more than ever, Mixtape seems ready for a title push. After a season in which key contributors sustained varying levels of injuries, Mixtape is healthy and has recruited back a number of important players missing from last season’s roster. 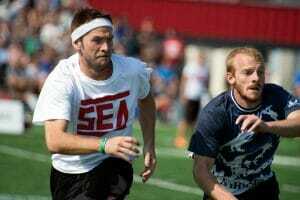 Not enough can be said of Mark Burton, who is coming off another strong AUDL season. Mixtape also snagged Ari Lozano and Abbie Abramovich, skilled young athletes who have matured as players since their last stint with the team. This may be the most well-rounded roster Mixtape has ever assembled — almost all of them are returners. Don’t expect Mixtape’s game plan to change much, big throws and bigger downfield plays are what keep Mixtape spinning — and could bring them all the way to a championship. Blackbird has wiped the slate clean this year. After a bit of an uneven season last year, the team was dealt a tough hand with the loss of the Norden brothers, Casey Ikeda, and Lauren Casey. Still, the Bay Area has constantly shown itself to have some of the greatest depth in the US and the incoming class of Birds will no doubt bolster the veteran squad. New players like Nightlock’s Briana Cahn coupled with Seth Reinhardt and Jamie Quella from Revolver may be exactly what Blackbird needs to again challenge for a title, or at least get back to semis. 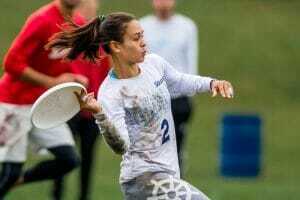 In a year with WUCC bids on the line, that is no doubt what they are thinking too. Despite a national title last year, there’s no way of getting around the fact that Slow White’s roster looks fairly different this season. Slow White has revamped their roster considerably, something that could prove to be detrimental for a team that won a championship off depth. They do return Jeff Smith and Tannor Johnson, who will no doubt marshal the offense. Boston has also enticed Caitlin Fitzgerald and Caitlin Go into joining their numbers; both Caitlins can fit incredibly well into a system and will be valuable role players in a squad of role players. Don’t expect Slow White to be flashy this season, expect them to get the job done efficiently. AMP has the fortune of both a strong returning class and a young one. Philly really tightened their offense for the 2016 season and proved that they should be in the conversation for title contention. For their youthful core, the extra year of college ultimate between club season may prove to be what tips the scales in favor of AMP in 2017. Raha Mozaffari continues to shine with some of the best field awareness in the entire division; the combined talent of Nick Purifico and Ben Pelleg is set to haunt defenders with the blistering pace they set in the game. AMP is incredibly focused and disciplined; in a division notoriously difficult to predict, this could be what keeps AMP as a powerhouse. Steamboat unassumingly pulled off the best regular season record of any Mixed team in 2016. While competing in three TCT events, they only took a single regular season loss. This year will be much harder for the Ohio team, as no one is underestimating them anymore. Steamboat will be in the top bracket for most TCT events that they attend and will have a target on their back. In hopes of staying ahead of the curve, Steamboat has retained a large core of players with incredible chemistry. They also have signed on Brandi Skanes, who was a defensive revelation at College Nationals and will bring that grit into the Mixed division. Steamboat trusts their ladies downfield and may have used them the most efficiently of any mixed team at Nationals. Considering how many returners they have, it seems unlikely this will change. After coming out of a region that has been dominated by Blackbird and the Polar Bears in recent years, 2016 finally saw Mischief regain their spot as the highest finishing squad out of the Bay Area. Their hope is to maintain Bay supremacy with important pick-ups in Cody Kirkland, Jordan Taylor, and Han Chen. Chen, known for her incredible range of throws, won the College Defensive Player of the Year award this spring and will be additive to either line, complementing Mischief’s strong veterans like Evan Boucher and Brett Peterson. Both Chen and Manisha Daryani (returning) should have no problem finding a role in Mischief’s system. After the success they saw last year, it seems Mischief has all the pieces to maintain that same standard. For Drag’n Thrust, the change of scenery from Frisco to Rockford seemed to be an unwelcome one. Drag’n was unable to defend their three consecutive titles, losing handily to eventual Champion Slow White in semis. 2017’s iteration features the absence of a lot of their veteran female talent, highlighted by the loss of Sarah Anciaux (to Heist), one of the most dominant women in the division. Her departure can’t be overstated — Anciaux was a driving force for the Minneapolis offense. Though Drag’n still has most of its core intact, that core is aging. Enter college phenoms Marty Adams (Duluth) and Charlie Schuweiler (St. John’s): young, athletic, and eager for their first appearances on the mixed club stage. Captains Sarah Meckstroth and Mike Clark will need them both if they plan on returning to the top of the mixed mountain. Of course, it doesn’t hurt to have players like Jay Drescher, Bryan Schoenrock, and Erica Baken either. Last year’s national runner up faces the unfortunate reality of losing their best player in Chris Mazur. That, combined with the loss of a bunch of other veteran depth, likely bumps Connecticut out of the title hunt this year. But they do retain the enough talent and experience to ensure Metro does not fall too far from relevance; the remaining players are unquestionably eager to prove that their Nationals run was a sum of all their parts. Their chemistry and deep familiarity with each other is not going anywhere, but Metro North’s core is not getting any younger and time is running out on a possible title run. A first time participant in the Elite Flight, Dallas’s top mixed team has been the talk of the preseason with a new class of recruits, none bigger than the frequently referenced Chris Mazur. Bringing in the 2016 Mixed division OPOTY and outright one best players in the division will always be a bonus. Combine that with the retention of the skill of Jenna Bigbie, Jonathon Higgins, and Krystina Morris and Dallas looks ready to take a huge step forward. They will still need to prove an ability to compete with the best clubs in the country, but they’ll be well situated to showcase that ability with the fourth and sixth leading assist throwers from last year’s Nationals. Always take early season results with a grain of salt, but Wild Card has beaten the defending national champions (Twice!) and the national runners up in the past month. A comeback win against Slow White two weeks ago at Boston Invite may be the sign of big things to come from Boston this summer. After a down year last year where they brought in a new young crop of talent and missed Nationals, Wild Card’s roster is revamped and a year more experienced. Ex-Ironside big man Alex Kapinos will pair nicely with veterans Matt Heath, Lauren Nelson, and Robin Meyers. Ian Engler remains one of the more underrated players in the division and could help lead his squad back to Sarasota this October. Surprisingly, Grey’s biggest storyline is the loss of two players that weren’t high-profile until the past year provided them with breakout performances. Antoine Davis and Ella Juengst have moved on to other ambiguously colored pastures after having really grown through their time with Grey in 2016. Antoine Davis is now with Revolver after excelling in the AUDL and Ella Juengst owned HS Nationals. While the loss of this youthful talent is tough, so is the rest of the turnover that has occurred in their roster. Close to half of their roster are new to the team and Ambiguous Grey will look very different from how they did in 2016. Jarnail Bajwa will be back as the primary shooter and Alanna McKee will no doubt make some stellar defensive plays. But this team’s strength relative to previous iterations remains ambiguous. Shame. was definitely one of the dark horse contenders of 2016. By putting their mark on Nationals and taking Mixtape to double game point on the Ultiworld livestream, shame. made their name known. Heading into a season in the Elite Flight means opponents will be more familiar with the Shame. roster and they’re going to be paid the respect they are due. While they lose the valuable Joel Anton, their big roster coup is stealing Ashley Daly Morgan from Molly Brown. Shame. has not had any official tryouts as rain delays constantly got in the way of their attempts; it would not be surprising to see them only consolidate full strength as the season progresses. The biggest surprise of 2016, No Touching! stunned everyone when they defeated CLX to take the third and final North Central bid to Nationals. Named for a line in Arrested Development and known for their trademark Banana Stand (which always has money in it), no one saw No Touching’s 2016 surge coming — even themselves. But take a hard look at the roster, and you’ll see it’s filled to the brim with incredibly talented older players, including speed demon Jolien Munsterhuis, fresh off a Beach Worlds in which she led the women’s masters division in goals. The aforementioned Sam Valesano was one of the most unstoppable forces in Rockford last fall. It’s tough to know exactly what this roster will look like in September — older, talented players seemingly come out of the woodwork as the Series rolls around. What we do know is that 2016 Sub Zero captain Patrick Jensen and his (relative) youth will be a dominant big man in the division. Pittsburgh’s top mixed team has reloaded and is ready for another, hopefully more successful run at Nationals this year. Another year of experience for the younger players on this team will be especially useful. Returners Megan Briggeman and Maria Bajzek are both goal-scoring machines and basically unguardable when they are on. Jed Farber and Jesse Kummer will continue to be rocks in the backfield and keep piling up assists. One of the darlings of last year’s Nationals was also one of the most balanced squads at the tournament. Rather than rely on a few high-usage players, 20(!!!) different players registered at least five combined goals and assists at Nationals last year. Most of those players return for another round. Denver’s loose style of play and easy-going mentality pairs nicely with their spread the ball strategy. Another season of experience and chemistry will bode well for them. Madison will retain most of their throwing prowess from last season in Ari Davidson and Josh Wilson, but they lose their goal scorer extraordinaire, Eric Alexander, who put up an impressive 18 goals at Nationals last season. Their depth should be able to make up for Alexander’s loss and in a crowded North Central region that could legitimately earn anywhere from two to four bids this season, they’ll need to be ready to if they want to get back to Nationals and build on their quarterfinals appearance. If you recognize the names on the Polar Bear’s roster, it’s not because you remember them from last year. Currently the team has more rookies than they do returning veterans. It’s safe to say that this is a rebuilding year for the team, but that does not exclude them from contention. The Polar Bears have drawn from the best college talent around the Bay with players such as Cheryl Hsu and a large contingent of the Cal Poly squad that made it to prequarters at Nationals. The Polar Bears are young but ready to prove their worth. It’s unclear how high of a ceiling they truly have, but for now they remain unproven. This team might be the embodiment of what so many of us love about ultimate. A team of veterans coming together to stick it to “the man” (USAU), getting rowdy and heckling furiously, and then just missing a chance to relive their glory one more time at Nationals, losing on double game point in the game-to-go. This fan favorite returns once again in pursuit of a trip to Nationals and you can be sure they will be extra motivated with the return to Sarasota this Fall. Imagine that the UPA played in Seattle, and instead of making Nationals two years ago, they didn’t. You may end up with a roster roughly equivalent to BFG. Like their counterparts from Chicago, BFG were just a point away from Nationals last season, and they had a strong veteran roster that got better as the season went on. While their roster may not yet be finalized, it appears they may be losing a number of dangerous weapons in Adam “Chicken” Simon, Brian Stout, and Misha Horowitz. Still, it has been shown over the years in mixed that an experienced veteran team should not be completely counted out. Once a dominant force in the division, CLX now finds themselves teetering on the edge of relevancy and may be pushing closer to the abyss of mid-level mixed teams this year. After succumbing to Minneapolis’s second team at Regionals last year, CLX loses its top four goal scorers: Brittnee Grimshaw, Kurt Brorsen, Ryan Tucker, and Neal Hanke. Kevin Seiler always seems to unearth new talent in the Midwest and there is far too much history here to say CLX can’t return to the elite, but unless they find a way to replace a ton of firepower, they could be looking at another season ending in early Fall and the potential of fading from the Nationals picture for years to come. Florida’s top mixed team has a wildly new look this season and may suffer for it. Losing young standouts Tanner Rapasky and Jacob Dummeldinger is a tough break, but they do retain the services of the Wachobs, Hayden and Bennett. For a team dominated in stats last year by their male players, they may be able to use their women more effectively this season to succeed in the relatively weak, wide-open Southeast region. Going into their second year, Toro will hope to build on their success from last year. They were able to make the semifinals of Regionals, losing by three to the team that would ultimately earn the region’s lone Nationals bid. Missing out on a Nationals bid is hardly damning for a first year teams, and this time around Toro may be able to capitalize on a wide-open region especially as contenders G-Unit may be stepping backwards. Last season, Bucket started the regular season off strong with multiple wins against G-Unit and an admirable performance at the Elite-Select Challenge, but the longtime Southeast champions ultimately faltered at Regionals. This season will be a big test for Bucket, a program that has historically been able to pull some decent talent in Atlanta, but has struggled in recent years to get over the hump. Again, the Southeast region has historically been fairly weak in Mixed and is down even more this year so it may come down to whomever peaks in September and plays their best ultimate at Regionals. It’s telling that the Bay Area has four mixed teams in the top 25. ABBQ already made a big splash with a final appearance at Cal States that had every strong mixed team from California take notice. Of course, Cal States is a warm-up for teams. ABBQ also has not yet fully consolidated its roster (on USAU there are currently 12 players) so there is a lot yet left to be determined. Last season Cosa Nostra found their one Achilles’ heel to be their South Central rival Love Tractor and if they want to get to Nationals this season they will need to overcome that mental block in the form of a team that beat them three times last season including twice at Regionals, ending their season. Comments on "The 2017 Club Season Mega-Preview: Mixed Division"